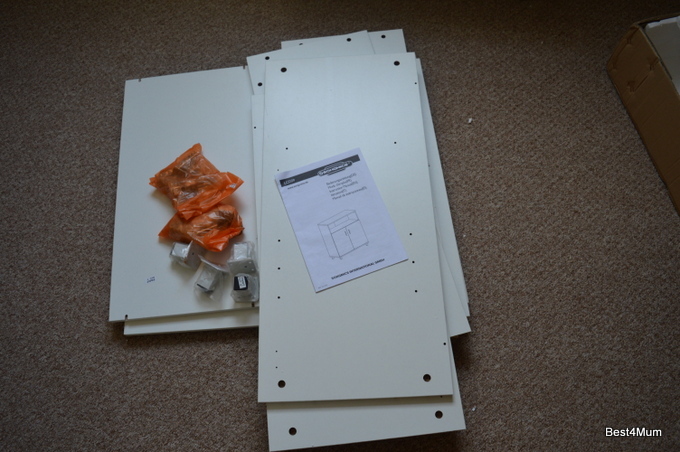 Flat pack furniture shouldn’t have to be so hard to put together. I’ve had no problem assembling lots of items, but sometimes it’s all a bit much even when it seems like the makers have set out to make it easy. This particular set looked good to begin with: all the pieces were labelled and the parts were numbered. There were even some spares screws and things. It all started well, although I quickly started to get bored with all the screwing in. I guess I should have been suspicious when I realised that they had included a screwdriver in the set. It’s certainly had a lot of use and I’m far from being finished yet. In fact, I’m starting to doubt my capability to finish. Part of me just wants to give up and write it off as a bad job, but the other half of me wants to press on and get it done and I think it will be a good piece of furniture in the end. In the summer I assembled a garden bench in just a few short minutes. This cupboard has already taken many times as long and its a fraction of the size (not that the size of it matters that much really in terms of construction). I think it may be quite a while before I sign myself up to construct flat pack again – it has been a bit of an ordeal and I’ve only recently got over the torment of putting together a mini poly tunnel over the summer. Do you have any flat pack disasters you could tell me about? Maybe you find it really easy to do, or maybe you delegate ( I think I’ll have to get J to make any flat pack stuff in future). What’s your strategy or do you avoid it altogether by buying ready-made furniture?